Breslau (Polish, Wroclaw), a city of Prussia, capital of an administrative district of the same name in Silesia, at the junction of the Ohlau with the Oder, 180 m. S. E. of Berlin; pop. in 1871, 208,025, of whom about 58 per cent, are Protestants, 33 per cent. Roman Catholics, and 7 per cent. Jews. The Oder is navigable from Breslau for large boats. 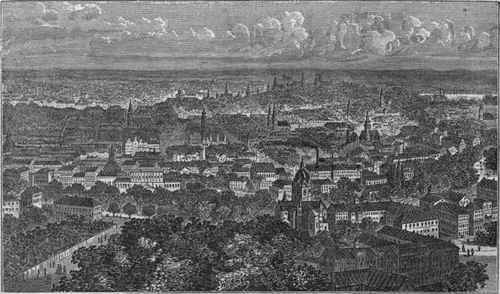 It is the second city in size and importance in Prussia. Its revenue in 1871 amounted to 30,251,651 thalers. It is connected by railway with Cracow, Warsaw, and Vienna, with Berlin and Leipsic, with Posen and Stettin, and with Schweidnitz and the rich manufacturing and mining districts of the Riesengebirge. It is an important emporium, has many mercantile establishments and large annual fairs, and is the most considerable wool market in the world. All the agricultural, manufacturing, and mineral produce of Upper and Middle Silesia comes to its market. Cotton, linen, and woollen goods, metals, coal, spirits, glass, paper, grain, and dyestuffs are among the principal articles of trade. In the city itself there are manufactories of dyed goods, and of leather, needles, liquors, refined sugar, tobacco, oil, cotton, linen, fine iron, gold and silver ware, broadcloths, laces, earthenware, straw hats, beer, vinegar, etc. The town is well built, and has a circumference of 11 m. It has many remarkable buildings, among which are St. Elizabeth's church, begun about 1250, with a tower 354 ft. high, and a celebrated organ, the church of Mary Magdalen, with two towers, the Reformed church, the Catholic cathedral, with many monuments of the 13th century, the Sandkirche, the church of St. Dorothea, and St. Michael's church, recently built by the prince bishop; the council house, the university building, the royal palace, the new'hall of the diet, the Jesuits' college, now belonging to the university, the residence of the prince bishop, the palace of Count Henkel, and the central railway depot. 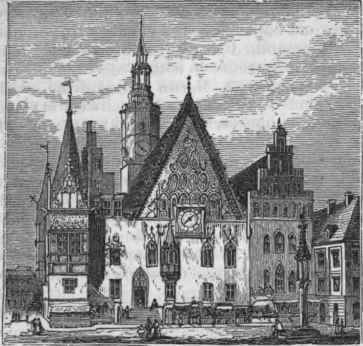 The city theatre was burned in 1865, but soon rebuilt. In the market place is a statue of Frederick the Great, and one of Blucher in the Blucher place. The streets are well paved and broad, with granite 'sidewalks, and lighted with gas. The benevolent institutions are more numerous and better provided than in most cities of Germany. There are four gymnasia, a seminary for classical and one for popular teachers, an architectural and artistic academy, and a university founded in 1702 and enlarged in 1811, which possesses a library of upward of 300,000 volumes and many manuscripts, a botanical garden, an observatory, a clinical institute, and various scientific collections. There is a missionary and a Bible institution, and the Leopold's or imperial society of naturalists has its seat here. A zoological garden was opened in 1865. There are four large libraries besides that of the university, several small but valuttble picture galleries, a numismatic cabinet, 18 hospitals, and four orphan asylums. - Breslau is built on originally Polish territory; it was founded about 1000. When in 1163 the surrounding territory was separated from Poland by the emperor Frederick I., who intervened in a quarrel of the sons of Ladislas II., and made two of them, Konrad and Boles-las, independent dukes of what is now Silesia, a city charter was given to Breslau, which was already inhabited by a large population of Germans. In 1335 it came into the possession of the Bohemian kings, and in 1526, with Bohemia, into that of the Austrians, from whom Frederick the Great wrested it by the invasion of 1741 and the seven years' war. Like all Silesia, it shared the good and bad fortune of Bohemia in the 14th, 15th, and 16th' centuries, and succumbed in two attempts of the citizens to make themselves independent of the archbishops and the patrician families. It early embraced the reformation. In 1742 the first peace between Frederick the Great and Austria was concluded here. In 1757 the Austrians defeated near the city a weaker Prussian army, but were driven out again in the same year by Frederick's victory at Leuthen. In 1760 Tau-enzien bravely defended the town against Loudon's besieging army. In 1806-'7 it was beleaguered by the French under Vandamme, taken, and the fortifications demolished.